In following F1 you would be forgiven for feeling that you need as much familiarity with geopolitics, foreign policy and the international human rights movement as the sport's esoteric matters. And this in a pursuit that at its core is as simple as which car can complete a distance most quickly. But it is a sport also that over time has developed a weakness for keeping bad company. And with this it tends to have at any moment at least one round that causes particular discomfort, for reasons that reverberate way beyond the circuit's perimeter. For a while it was Bahrain. Then for a time it was Russia, which with its president appearing in the podium ante-room after the race left little to the imagination. Others such as China have had their associated murmurings. Now we have Azerbaijan, debuting on the F1 itinerary this weekend. And beware judging a book by its cover. The image presented will be one of an oil-rich capital of Baku, all high-end boutiques, smart eateries and elegant architecture - classical and modern - next to the lapping Caspian Sea. Indeed there have been plenty of efforts already to project that image. But, as was the case in those other host countries mentioned, beneath the veneer things become rather less savoury. While the country is nominally a democracy there are considerable wider doubts about its human rights record, such as via authoritarianism, political corruption, potentially fraudulent elections and oppression of the Government's opposition, doubts about the freedom of the press and the impartiality of the political media coverage, state-sanctioned violence, the detention of political prisoners - including human rights defenders, journalists, bloggers and activists - and forcible home evictions. It's a tale not entirely new, F1's visits to apartheid South Africa back in the day share a strong family resemblance, yet these days this kind of cringe is especially common. Bernie has always followed the money but our age of increasing costs, declining investment from sponsors (particularly from tobacco) and growing gaps in spectator areas means that the sport is ever more reliant on income from hosting fees. 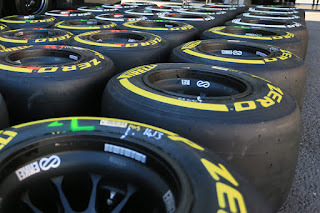 Add too that latterly CVC has provided a pitchfork at F1's back to maintain its thick bottom line. And it's no coincidence that it is the questionable regimes that are most willing to pay inflated sums. 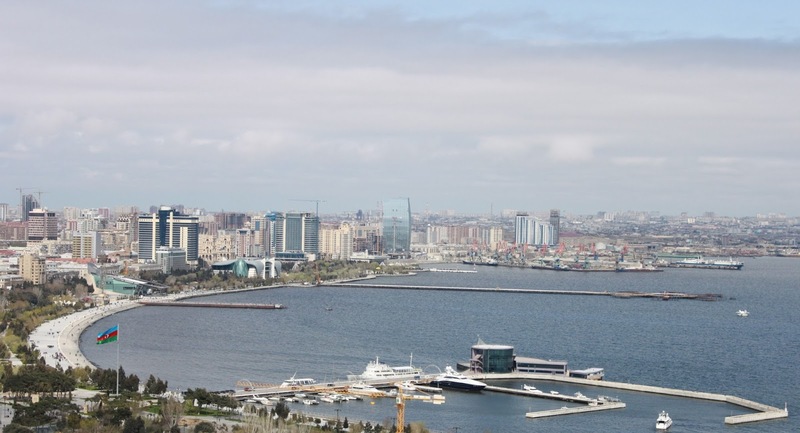 This was outlined in reference to Azerbaijan by Phil Bloomer, executive director of the Business and Human Rights Resources Centre: "We had the European Games there last year, which was a highly expensive vanity project. These mega sporting events act as a sanitiser and also promotes the image of a modern economy. Formula One also has form in this area. In Bahrain the government used the Grand Prix to project a very different image to what was happening in the streets, where demonstrators were being bludgeoned, where protesters were being imprisoned." It's not even a coincidence that this one is titled the 'European Grand Prix', as the regime is keen to promote Baku as a European centre (though whether it's actually in Europe at all is a matter that can be debated). For these reasons the familiar line of defence at such moments, that 'sport and politics shouldn't mix', surely does not apply. So sure enough human rights bodies have been critical, with Sport For Rights - a coalition of international organisations established to draw attention to Azerbaijan's human rights record - coming up with a booklet entitled 'A Full-Throttle Attack on Human Rights: What Reporters covering the F1 Baku Grand Prix should know'. Hardly good publicity. It was hardly unforeseen either as the country hosted the 2012 Eurovision Song Contest and exactly the same concerns and controversies were raised, as they were in its staging of the 2015 European Games in athletics. As Bloomer added, "Azerbaijan has got form". You wonder where it might end too. 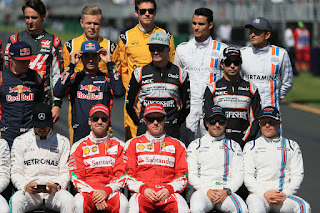 I'm put in mind of the team principals' press conference that took place in Hungary in 2014, the very same weekend in which the Azerbaijan round was officially confirmed. After several minutes of ducking and weaving from the assembled head honchos on the matter of race hosts, someone asked 'Would you accept a Grand Prix in North Korea?' A good question, one that wasn't answered then. And it still hasn't been. Ultimately also the sport is firmly among the losers. The taint by association surely harms F1's brand, and this has its many manifestations including in the language F1 most understands. "There is rising evidence that major sponsors are running out of patience with major sports who are constantly putting their events in highly oppressive states", Bloomer went on. It seems he has a point. There are plenty of F1 cars with barely a sponsor on them; taking those away that are related to team ownership, to technical tie-ups or are associated with drivers, suddenly F1 sponsors become a highly endangered species. And while the sport's recent ways as mentioned owe something to declining sponsorship revenue it seems reasonable to think there's a cyclical relationship going on, that the ways also contribute to the lack of investment. Vast global brands whom you would have thought perfect for an F1 audience (McDonalds, Black & Decker…) are nowhere on the radar. Williams' title sponsorship with Martini announced at the start of 2014 seemed the first time in years that such a deal had been struck by a team in this game. That's because it probably was. And there's been nearly nothing since. Sadly also there are reasons to think that we won't be compensated albeit partially by strong local enthusiasm this weekend in Baku. The circuit's grandstand capacity is rather limited at 28,000, and a recent report had even so less than 10% of the tickets being sold. But the race goes on. 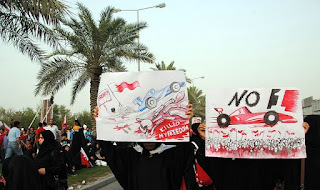 The Formula One Group and the FIA developed recently a human rights policy but it's difficult to know from its wording or action what its implementation will ever amount to. And while the FIA approves the calendar wholesale its record of blocking Bernie's selections is near non-existent. Also to my knowledge a Grand Prix has never been cancelled on moral grounds. Yes, you may be shouting at this point, the Bahrain race of 2011 was indeed canned, but that officially was on the basis of security and Bernie didn't waste any time in reinstating it (indeed, he tried to reschedule it in the same season). South Africa we've mentioned also, but that race being shunned owed to commercial pressure. If there is a family resemblance with this race and previous controversial stop-offs, the Baku City circuit itself also has a family resemblance and with the previous two tracks on the calendar. As a downtown street track dashing between buildings not far from a harbour front the Monaco likeness is obvious (Bernie has indeed promised another Monaco), particularly in its very narrow turn 8 to 10 section between Baku's ancient city walls which has a whiff of the principality's Mirabeau-Station Hairpin-Portiers part. But also Baku has a lengthy flat-out 1.2 mile blast along the sea front, which to provide a yardstick is of similar length of La Source to Les Combes at Spa. Therefore the new track may instead of Monaco have more of Montreal about it, or perhaps may even surpass the Circuit Gilles Villeneuve in allowing cars to stretch their legs. Straight-line speed will count in other words (as it doesn't at Monaco). As is the case in both of those recent venues few of the Baku corners appear quick and none at all are long. Set-up balancing grip in the tight twisty stuff and speed in the extended full-pelt section will be a challenge and those with good mechanical grip will be well set. Red Bull excels in this, as it does on traction. Yet the mile-plus full throttle zone will likely be more regrettable to the Milton Keynes squad, as seen in Canada when, despite looking reasonable through the speed traps, Max Verstappen admitted that the Bulls had to trim out their set-up so not to lose out on the long straights, and it seemed to show in competitiveness. The Renault unit even with its recent improvements doesn't have the acceleration nor top end urge of the Merc or Ferrari. But in a variation from Canada temperatures are expected to be hot in Baku (in addition rain is thought less likely than in the Bahrain round) and therefore warm Friday practice in Montreal, rather than chilly Saturday and Sunday, may be our better guide to Baku pace, and again that may be bad news for the Bulls. As Daniel Ricciardo said prior to the Canada race: "Cooler temperatures will help us...On Friday, we struggled a bit with the hotter track temperature." Instead Mercedes topped Friday's running in Montreal, both on single lap pace and longer runs. The long straights and high temperatures tilt things firmly towards the silver cars and away from the RB12s. The Merc remains the best power unit out there plus the silver team's efficient chassis allows it to run more wing with relatively little drag penalty. While Ferrari is likely to maintain its place reclaimed in Canada as Mercedes's most probable irritant. 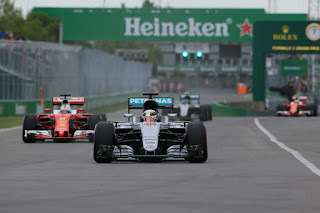 In Montreal's Friday running it was a clear best of the rest behind the Merc, with it getting particularly close on race runs. Its new turbo had a clear positive impact while, whisper it, it might have got to the bottom of its tyre warm-up problems for a qualifying lap. In Canada its quali out-laps were aggressive and Sebastian Vettel's final qualifying mark was within two tenths of Hamilton's pole time, which is the closest he's got to the silver cars on a Saturday since their mysterious off weekend in Singapore last year. It was pointed out though that doing it again in hot conditions - which it will get this time - will be the real acid test as to whether it has this matter licked. Mercedes remains clear favourite though and if this one is indeed like Montreal then it may be good news for Lewis Hamilton. Hustling a car between walls on a low grip surface, as well as big braking zones, all are quite his thing. He has the unmistakable sense of things going his way right now too. The high temperature of course will strain parts and cooling including to -given the track's layout - already strained brakes. Mercedes reliability in such areas has in the past been iffy particularly if the ambient does get up, so perhaps just as in Canada unreliability will seem in advance to rivals the most likely means of Merc stepping down. 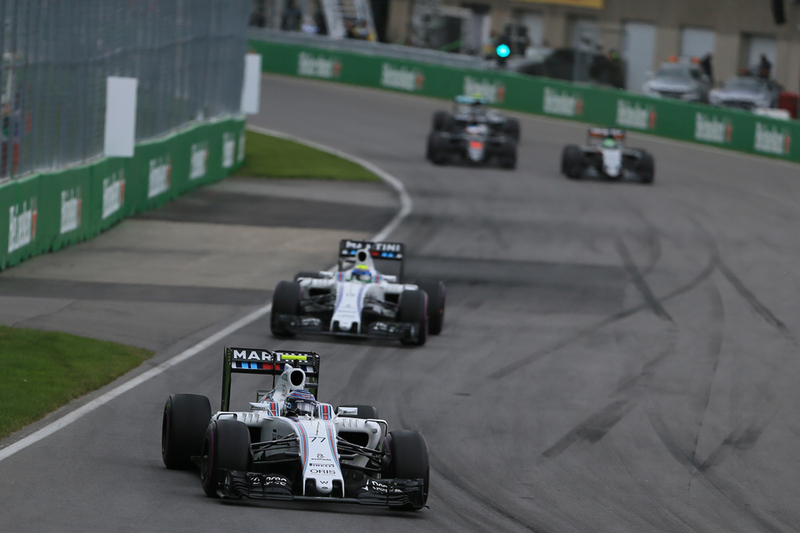 As for the rest, a Montreal esque layout could be good news for the fast-through-the-air Williams, and Valtteri Bottas indeed bagged third place in Canada. Then there is Force India which also tends to go well on such tracks, indeed Sergio Perez started P5 in Spa last year with its lengthy top speed section and P7 in Russia this, on its low grip surface. McLaren may struggle however with its low top end speed - it ceded plenty in Montreal's speed trap - and there's reason to think that this one, again like Montreal, could be tough on fuel consumption. 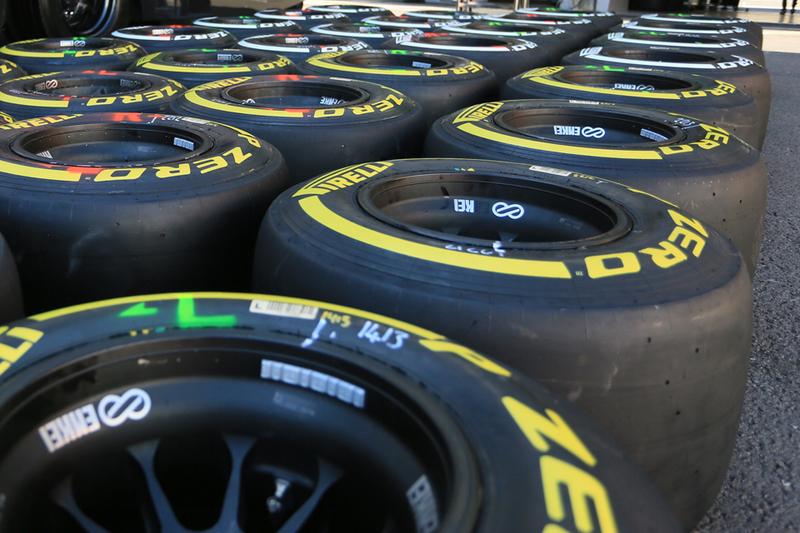 Even with the softest compounds available tyre degradation has been very low in the last two rounds, aside from when the temperature dropped in Canada causing the tyres to grain, and as outlined such ambient temperature is not likely to be replicated in Baku. This time we may add that new surfaces (the local cobbled streets have been covered especially for the race, then apparently the tarmac will be scraped off afterwards) tend to have bitumen close to the top, which means they are rather like a sheet of glass and therefore degradation drops further (see Sochi visits quintessentially). As ever at new circuits too Pirelli has erred on the side of caution by - unlike in Monaco and Montreal - bringing the medium rather than the ultra-soft. Easy one-stoppers with low degradation therefore are probable, and teams appear to agree given they've in large part shunned the medium and piled up on the super-soft. Yet while teams are tremendously clever at simulating new venues really the running in practice (in Practice...) will still provide a steep learning curve. Particularly given, as Pat Symonds explained, "simulations have had to be done using surveyor's maps rather than detailed track scans...a new circuit such as Baku will always throw up some surprises". The biggest challenge of all may prove to be logistical. Time was that new venues were never put back-to-back with another as simply there were too many logistical unknowns. That is a practice waived now it seems, and with two stop-offs that hardly are neighbours, given there are mere days between dismantling of camp in Canada and setting the circus up in Baku. Let's hope the previous practice doesn't show itself this time to be a good practice. Tom Butcher, who is overseeing the circuit's construction, has described this timing as the "biggest problem" for F1 setting up and believes that "those last few days will be chaos". But then again, perhaps as outlined such things are the least of this round's problems.